I have often wondered why there is a both a Men’s and a Women’s outhouse at the rustic campgrounds. I have never been inside the women’s outhouse, but I can tell you from experience that the men’s is nothing special. It usually has an indescribable stench and bugs flying around it. I can only assume the women’s vault toilet is beautifully decorated and has a wonderful aroma. I wonder if they make some Happy Camper for outhouses. I am also not sure why many campgrounds describe them as “Vault Toilets” as if what is in them is highly valuable. Somewhere in Michigan is the nicest outhouse, I just have not found it yet. P.S. I have plans on writing a book for the parks in the Upper Peninsula and the southern part of Michigan, but it is going to be a few years yet. I hope the sales of this book will help me with expenses to visit the other parks and write reviews for them. I hope you will follow me on my website and Subscribe to email updates so you won’t miss any new posts. I won’t send you a bunch of junk emails, it just an automated email that lets you know I just posted something new. I only post once per day so you won’t be getting a ton of emails from me. I have been using Facebook less and less With the continuous changes in the Facebook and Instagram algorithm that determines what you see on your newsfeed and restricts who gets to see my posts. If you have already subscribed to updates thank you very much, you have no idea how much it means to me. I took this photo last summer. It’s the boardwalk leading to the beach in Young State Park. Here it is January 2019 and one of the coldest days of the year and I am making plans for this summer. It is always surreal during the winter because I make my State Park reservations six months in advance. I think I am gonna start calling winter reservation season. December is June, January is July and February is August. I have a few reservations this year I hope you are able to get into your favorite park. 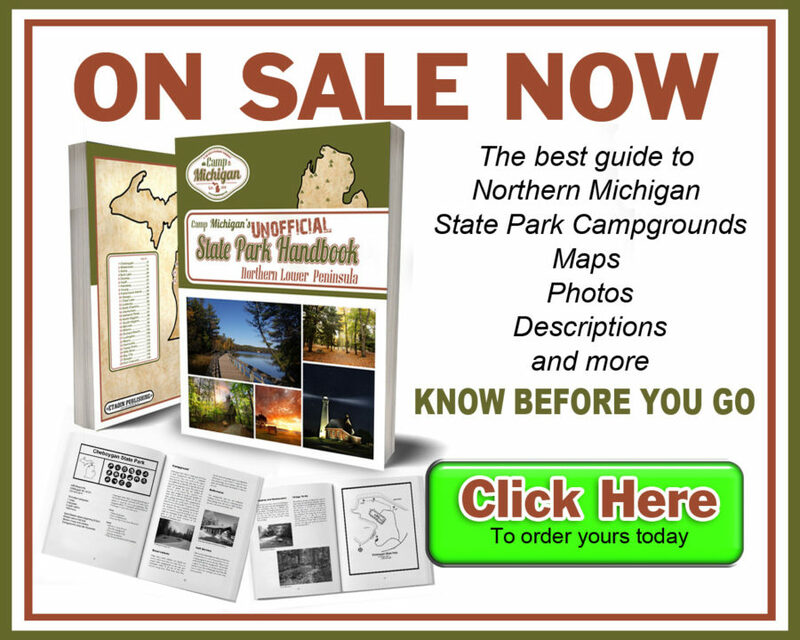 With all the people in Michigan that own RVs and the limited number of campsites it seems to be getting harder and harder each year to get the site you want. I need to make a reservation for an August trip next month Hopefully the odds will be in my favor. I hope you are staying warm this winter and I am looking forward to the upcoming camping season. It’s been a busy summer since I visited 46 different state parks. I took pics of all the bathrooms, beaches, playground, stores or anything I thought would be of interest. The trailer is winterized and ready to go into hibernation. This winter I plan on going through all my notes an pics and writing up reviews. I hope to compile them into a book at some point. It’s was interesting visiting so many parks. they all have some wonderful reasons to camp at them and they all have some negatives, but I would camp at any of them any chance I could get. I have a goal of camping at all of them and. I am up to about 30 parks that I have stayed overnight in. We camped at 8 different state parks this season and 4 of them were new to us. I made it to Ludington for a visit. I tried all summer long to get a campsite but no luck. hopefully next summer we will get to camp there. I have stayed at over 25 state parks in Michigan in the past 20 years. Spending nights in tents, pop-ups and travel trailer. Enjoying modern campgrounds or the secluded rustic campsites. I do a lot of traveling around the state working on my Lost In Michigan website HERE and I stay at Michigan State Parks to help keep the cost of traveling down. I created Camp Michigan as a place for me to share what I have learned and my experiences at the campgrounds. There are over 150 state parks so it’s gonna take me some time to post reviews on all of them but I hope you will follow along with me. I hope you will subscribe to email updates since facebook prioritizes your friends a family they will not show you many of my posts, I promise I won’t email you a bunch of junk email, it’s only an email to notify you of a new post which will be two or three times a week.